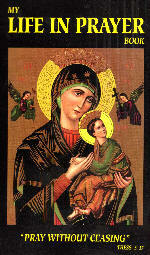 Come, O Holy Ghost, fill the hearts of Thy faithful, and kindle in them the fire of Thy love. O God, Who hast taught the hearts of Thy faithful by the light of the Holy Spirit; grant us by the same Spirit, to relish what is right and evermore to rejoice in His consolation. Through Christ, our Lord. Amen. Now make your examination of conscience. Act of Contrition. After the Examination of Conscience. O my God, I am most heartily sorry for all my sins, and I detest them above all things from the bottom of my heart, because they displease Thee, O my God, Who art most deserving of all my love, for Thy most amiable and adorable perfections. I firmly resolve, with the assistance of Thy grace, never more to offend Thee, and to amend my life. Increase my sorrow, O my God, and strengthen me in my resolution. Ah, my Jesus, I see how much Thou hast done and suffered for me, and I have been so ungrateful to Thee. How many times, for the sake of some miserable pleasure or fancy, have I bartered away Thy grace, and have lost Thee, O God of my soul! My dear God, pardon me: I am sorry; I grieve with my whole heart, and I hope for pardon from Thee, because Thou art infinite goodness. If Thou wert not infinite goodness, I should lose hope, and I should not even have the courage to ask Thee to have mercy on me. Bid me bear, O Mother blessed! Make frequent acts of contrition while waiting to go to Confession. 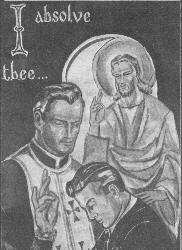 Picture vividly to yourself, that the Priest represents our Lord Himself and accuse yourself of your sins and their necessary circumstances to the Priest as you would to our Lord Himself and follow the directions and advice the Confessor gives you.